A special Dining Out for Life San Diego Food Truck Gathering will take place in The Center’s parking lot on Thursday, April 28 from 5:00 p.m. – 9:00 p.m. The following fabulous food trucks are donating 25% of sales at the special Dining Out for Life Food Truck Gathering taking place in The Center’s parking lot located at 3909 Centre Street, 92103 (1 block west of Park and University) from 5:00 p.m. – 9:00 p.m.
Jane Schmoll and The Center’s Family Matters program will be your special guest Ambassadors for the gathering along with DOFL veteran ambassador Joanna Clark. Grab your family and friends and make a date to dine out for breakfast, lunch and dinner on Thursday, April 28 and 25-100% of the day’s sales will benefit HIV/AIDS services at The Center. For a complete list of participating restaurants, visit www.diningoutforlife.com/sandiego or call Donnie Luehring at (619) 692-2077, ext. 246. 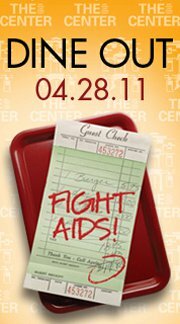 Dine Out, Fight AIDS on April 28!